It is customary to split clustering analysis into an optimization level, then a (preferably) graphical representation level to take benefit of human vision for an effective understanding of (big) data structure. 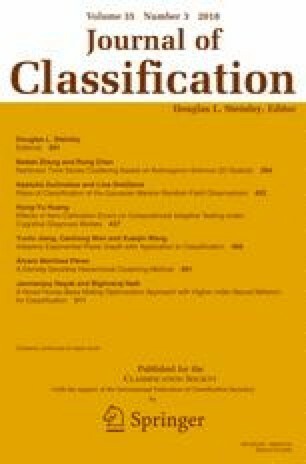 This article aspires to clarify relationships between clustering, both its process and its representation, and the underlying structural graph properties, both algebraic and geometric, starting from the mere knowledge of a dissimilarity matrix among items, possibly with missing entries. It is inspired by an analogous work on seriation problem, relating Robinson property in a dissimilarity with missing entries, with interval graph recognition using a sequence of 4 lexicographic breadth first searches. An anonymous referee deeply interacts with the manuscript so that it brings many clarifications and improvements. The author is grateful to him/her for the deep and accurate reviewing. Blum, N. (2015). Maximum matching in general graphs without explicit consideration of blossoms revisited. CoRR, arXiv:1509.04927. Chambers, E.W., Erickson, J., Nayyeri, A. (2009). Homology flows, cohomology cuts. In Proceedings of the forty-first annual ACM symposium on theory of computing, STOC ’09. https://doi.org/10.1145/1536414.1536453. ISBN 978-1-60558-506-2. http://doi.acm.org/10.1145/1536414.1536453 (pp. 273–282). New York: ACM. Deineko, V., Klinz, B., Woeginger, G.J. (2006). Four point conditions and exponential neighborhoods for symmetric TSP. In Proceedings of the seventeenth annual ACM-SIAM symposium on discrete algorithm, SODA ’06. ISBN 0-89871-605-5. http://dl.acm.org/citation.cfm?id=1109557.1109617 (pp. 544–553). Philadelphia: Society for Industrial and Applied Mathematics. Edmonds, J. (1987). Paths, trees, and flowers. In I. Gessel, G.-C. Rota (Eds. ), Classic Papers in Combinatorics (pp. 361–379). Boston: Birkhäuser Boston. https://doi.org/10.1007/978-0-8176-4842-8_26. Erickson, J., & Whittlesey, K. (2005). Greedy optimal homotopy and homology generators. In Proceedings of the sixteenth annual ACM-SIAM symposium on discrete algorithms, SODA ’05. ISBN 0-89871-585-7. http://dl.acm.org/citation.cfm?id=1070432.1070581 (pp. 1038–1046). Philadelphia: Society for Industrial and Applied Mathematics. Gonçalves, D., & Lévêque, B. (2012). Toroidal maps: Schnyder woods, orthogonal surfaces and straight-line representations. CoRR, arXiv:1202.0911. Holten, D., & van Wijk, J.J. (2009). Force-directed edge bundling for graph visualization. In Proceedings of the 11th Eurographics/IEEE - VGTC conference on visualization, EuroVis’09 (pp. 983–998). Chichester: The Eurographs Association & #38; Wiley #38, DOI https://doi.org/10.1111/j.1467-8659.2009.01450.x, (to appear in print). Hruz, T., & Fortin, D. (1993). Parallelism in Hermite and Smith normal forms. Technical report, INRIA. http://hal.inria.fr/inria-00074594. Mohar, B. (2009). The genus crossing number. ARS Mathematica Contemporanea, 2(2). ISSN 1855-3974. http://amc-journal.eu/index.php/amc/article/view/21. Schulze, M. (2018). The schulze method of voting. CoRR, arXiv:1804.02973.